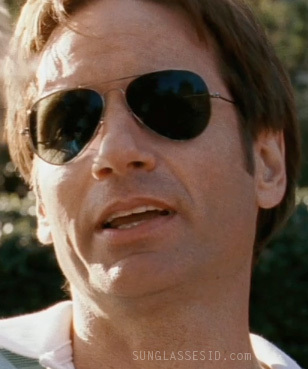 David Duchovny wears Ray-Ban 3025 Aviator sunglasses in the movie The Joneses. Most of the time he wears Persol 2867 sunglasses, but on the golf course he switches to these dark lensed Aviators. The frame might be silver or gold colored, it's hard to see.